In just one generation, Cascade Engineering has achieved considerable business success, while also striving to make a positive impact on society and the environment. Fred P. Keller, who founded the company with six employees in Grand Rapids, Mich., in 1973, says the business now generates about $350 million in annual revenues, up from $250 million in 2011. The enterprise, primarily engaged in designing, engineering and injection molding of large plastic parts, employs some 1,600 people and serves customers worldwide. The Cascade family of companies encompasses nine business units focused on a diverse array of markets and products: agricultural, material handling, office furniture, automotive, waste and recycling, polymer compounding, truck and bus, and RFID (radio-frequency identification) asset management. Cascade has proclaimed itself an “anti-racism organization.” Its welfare-to-career program helps employees transition off government assistance. The company also has committed to hiring returning citizens (people returning to the workforce after release from prison). Cascade is transparent about its progress toward these goals. Graphs depicting yearly progress on a variety of metrics are available on the company’s website, as are downloadable annual TBL reports. Cascade published its first TBL report in 2004. The company has gone even further in asserting its commitment to social responsibility. Cascade is a certified B Corporation, meaning that it meets high standards in social and environmental performance and transparency, and its governing documents state its commitment to all stakeholders (not just shareholders). A non-profit organization called B Lab grants B Corporation certification. (See below for more information on B Corporations and benefit corporations, a related legal status.) Cascade is one of the largest certified B Corporations and one of the few manufacturing companies to hold the certification, a status it first achieved in 2011. Companies pay an annual fee for B Corporation certification, which varies according to annual sales. (Cascade’s annual fee is $30,000.) B Corporations must apply for recertification every two years. Cascade estimates that six to eight staffers spent a total of 400 to 600 hours completing the complex, 152-question certification assessment, which also requires supporting data. 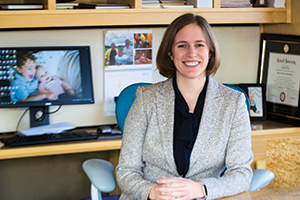 Fred’s daughter Christina Keller, 36, is president of the Cascade Engineering Campus Business Team, responsible for four of the company’s businesses located in West Michigan. Previously, she was president of the company’s largest business unit, CK Technologies, in Montpelier, Ohio. Fred’s eldest daughter, Lorissa Keller MacAllister, 45, serves on Cascade’s board. Fred, a widower, owns Cascade along with his three daughters (Christina Keller, Lorissa Mac­Allister and Susan Whitman, who is otherwise not actively involved in the company). Fred’s entrepreneurial spirit and family values were inherited from his parents. His father, Fred M. Keller, started out as a laborer and served as a master mechanic in World War II. After buying and then selling a die-casting business, he acquired Paragon Die & Engineering, an indebted manufacturer of aluminum die cast tools, for $1 in 1962. 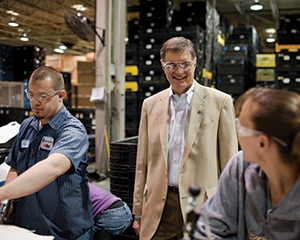 Fred P. Keller began Cascade as a division of his father’s business; the company incorporated as a separate entity in April 1973. Paragon, also based in Grand Rapids, still exists today. Fred P. Keller serves on Paragon’s board; his nephew Dave Muir is Paragon’s president. The senior Keller and his wife, Bernedine Johnson Keller, lived frugally, valued people and loved the outdoors, according to their son. Fred M. Keller once was a preacher in Michigan’s Straits of Macinac region. The Kellers donated generously to many Grand Rapids institutions. They started the Keller Foundation, which supports programs and services for children and families. Family Business Magazine recently spoke to Fred P. and Christina Keller about Cascade’s certified B Corporation status and the company’s commitment to the TBL framework. An edited transcript of the conversation follows. Family Business: How would you describe Cascade Engineering’s TBL philosophy — “People, Planet Profit”? Christina Keller: We don’t take a hierarchical approach to people; everybody has value. It’s not good enough to say, “Hey, you’re valued” — we need to go as far as [ensuring] that people feel valued in our organization. We have welfare-to-career, returning citizens and veteran programs, [helping] people who sometimes don’t feel valued and bringing them into the culture. The planet has always been a part of our upbringing; we always did things outside. And now that translates into the innovation around the planet — recycled materials, zero waste-to-landfill, etc. — in the facility. And then on the profit side: How can we be the most effective that we can be? How can we figure out how to solve problems? FB: Cascade has declared itself to be an anti-racism organization — not only a workplace where racist acts and comments are not tolerated, but also an environment where employees feel safe discussing issues related to race. Could you explain what this entails? Fred Keller: The dedication to anti-racism is something that we’ve been doing for six or seven years. The [Grand Rapids] community started a program called the Institute for Healing Racism, and I was one of the first to go through that. It was aligned so well with my beliefs, and also gave me tools to think about how to deal with [the issue]. My intention at the time was to make sure that we were not a place where racism would be tolerated. We were very clear about that. We had rules about it. We also required our supervisors to go through the Institute for Healing Racism program. Every person in the organization is required to attend what we call Diversity Theater, where we bring in actors who act out themes that actually happen in our organization and then ask the participants to design what they could do differently. So there’s an awareness building around inappropriate behavior. We use a dialogue process, where we have small groups of folks talk about very tough issues. Racism is one of the topics. You learn how to trust each other as you go through that process. We brought in a traveling version of the Jim Crow Museum, artifacts that are being sold or traded in this country that reflect on the Jim Crow era. Virtually everyone went through that display, and we had dialogue sessions afterwards. The result of all that is that we are seeing a very high sense of trust amongst people of color in the organization. And we measure that through attitude surveys. It’s really a gratifying thing to know that the culture of this organization can feel so inclusive, and that people feel safe here. That’s a very important part for me, that we deal with tough issues — we don’t just try to be off in our own enclave. That we try to be a place, as Christina was saying, where people know they’re valued. FB: What motivated you to seek B Corporation certification for Cascade? FK: I have been teaching a course at Cornell since 2002 on sustainable business. [When the course was first launched,] it was kind of radical thinking to be teaching something other than maximizing profit for the shareholders. I was the only antidote to Milton Friedman at the time at Cornell. When I learned about B Corp, I got to meet the three founders [of B Lab, the certifying organization], Jay [Coen Gilbert], Bart [Houlahan] and Andrew [Kassoy], and they’ve become good friends. I just wanted to support the movement, more than anything else. 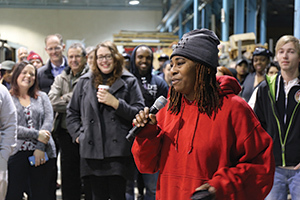 CK: When I look at the decision to become a B Corporation, as we were saying, the values have always been there.So the idea of joining a larger-scale group is really more out of trying to push the movement forward, and push it in a new way, and attract or come together with others that have similar values. [It’s not as if] we put the B on and started doing anything differently. This was kind of an additional certification to help us look at how we can get better and connect with a greater community. FK: The justification was that we’d be able to have a baseline to work from, and use that as a checklist to get even better. CK: We’re very metric-driven, you might say, and it’s always hard to find a social and environmental metric that you can use. One benefit of the B Corp metrics is that you can see how you rate. Somebody’s put some thought behind metrics, and we can work at improving those metrics over time. FK: Foundationally, [regarding] the societal and environmental issues that [B Lab] challenges you on, we had many of those things in place already. It was primarily understanding the questions that they were asking, to make sure we received the appropriate credit, because it’s all based on a point-scoring system. FB: How does the TBL concept differ from corporate social responsibility (CSR) or environmental, social and governance (ESG) criteria in public companies? FK: The way I describe it in my class is that there are what I call “Rings of Impact.” [Editor’s Note: “Rings of Impact” is a registered trademark.] At the center — mainstream, basically — are “Profit Maximizers.” That would be Ring 1. Ring 2, “CSR and Giving Back,” are folks who do corporate social responsibility work. Often, and I lament that it’s maybe too often, that is thinly veiled profit maximization. They’re really trying to burnish their image, so that people will buy more of their goods. Ring 3 is a group that I call “Doing Good and Doing Well.” A lot of private companies, a lot of family-owned businesses, fall in that category. And then there’s a fourth ring of impact: “Social and Environmental Problem Solvers,” the people who are actually designing their businesses to solve a social or environmental problem. That’s a growing entrepreneurial field, and I think it’s one that’s very encouraging. • Certified B Corporation status is not a legal status. • B Lab, a non-profit organization, is the B Corporation certifying agency. B Lab was founded in 2006 by Jay Coen Gilbert, Bart Houlahan and Andrew Kassoy. Coen Gilbert and Houlahan were previously co-founder and president, respectively, of AND1, a basketball footwear and apparel company; Kassoy was a private equity investor. • There are currently 2,334 certified B Corporations in more than 50 countries, representing 140 industries. • Certified B Corporation status is available to every business regardless of corporate structure, state or country. • To achieve certification, a company must receive a minimum score on B Lab’s B Impact Assessment. Additional documentation is required to verify the information. B Lab staff will also conduct an assessment-review telephone call, and the company may be subject to a background check. • Certification requires directors and officers to consider the impact of their decisions on all stakeholders. Depending on the company’s legal structure and state of incorporation, it may need to amend its governing documents to protect directors and officers. • Recertification is required every two years. • Certified B Corporations must publish a report of their social and environmental performance, assessed against a third-party standard. • Annual certification fees vary according to company revenues and range from $500 to $50,000+. For more information, see bcorporation.net. • Benefit corporation status is a legal status. • Thirty-three U.S. states and the District of Columbia have passed laws authorizing benefit corporation status, and six additional states are currently considering legislation. • Benefit corporation status is currently available for corporations only, although a few states offer benefit LLC options. • Directors and officers of a benefit corporation are required to consider the impact of their decisions not only on shareholders but also on society and the environment. In addition to overseeing the company’s financial performance, they must assess the company’s social and environmental performance. Benefit corporation status protects them from legal liability in doing so (even if the business is a public company or pursuing a sale). • Transparency provisions of benefit corporation legislation require these companies to create annual reports of their social and environmental performance. Reporting requirements vary from state to state. • B Lab certification is not required to obtain benefit corporation status. B Lab plays no role in benefit corporation oversight, although it advocates for legislation passage and offers a reporting tool to meet transparency requirements. • State filing fees range from $70 to $200. For more information, see benefitcorp.net. With regard to ESG, [adding] in corporate governance, I think, is a little bit of an interesting twist. But environmental and social measurements are key to that. I happen to have a Ph.D. teaching assistant this year who is doing her work in the area of ESG measurement. And it is a confounding field, because there are not many who are able to do it well. They primarily do ESG work in publicly traded companies, so they’re trying to relate it to how well they do from a stock performance standpoint. CK: We have said that intention does matter, especially because as things get hard, if you think that it’s a tradeoff — that charity or CSR is at the detriment to the bottom line, and that it’s something that you have to be carrying along — you might abandon that. Whereas if the intention is to be an employer of choice — that sustainability and the environment serve innovation, and it’s a cornerstone of what you’re doing — you do it because it’s the right thing to do. You’re more likely to keep that value and to translate that value across generations, regardless of whether the market is favorable on it or not favorable on it. So intention matters, and it’s not a tradeoff. 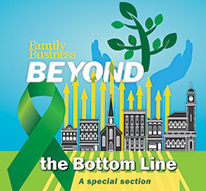 It’s really a reinforcing concept with the triple bottom line — they all reinforce each other. FB: Of course, your company must be financially successful in order to make this work. CK: Of course. It’s not a tradeoff. FK: “People, Planet, Profit” is the right order to remember those things, though. Profit is not the objective. The objective is to make a positive impact. And of course, we need to have profits in order to make a positive impact. FB: Cascade operates in an industry that is generally opposed to regulation, and you’re based in an area that’s largely Republican. Yet by undergoing B Corporation certification for Cascade, you chose to subject your company to rigorous environmental and social standards. How do you navigate the contradictions? FK: I don’t see them as contradictions. It hasn’t been difficult, really. You could call this area a Jerry Ford Republican area. We believe in rationale and reason. I certainly am respected for my views. They [Grand Rapids business leaders] understand the value that this corporation brings to the community. And there is not a conflict with other folks who may be even more conservative than I am. We could have good dialogue around it. I think that’s part of the problem: People who have different views go to their own echo chamber and don’t want to talk to folks who don’t think the same way that they do. I would say that this region has much more openness to that kind of dialogue. CK: I think a lot of the people in our situation are middle-of-the-road, and not the extreme of either side. If the regulation is non-value-add, then we shouldn’t just have blanket regulations. And if businesses could step up and be more socially responsible, we wouldn’t need as much regulation. There’s a lot of, I think, shades of gray in a world that’s trying to make things very black and white. FB: Why do you think B Corporation certification has been slow to catch on, particularly among family companies? FK: Well, they’ve designed [the certification process] to be rigorous. And I think it’s the rigor that slows people down more than anything else. It takes a fair amount of dedication to want to be certified. We are quite fortunate, being just a G1-G2 business. When you get to the third and fourth generation, my guess is that shareholders can have a disparate opinion about whether or not B Corporation status is important. It may not seem obvious to people, but running a company that has triple-bottom-line thinking, first of all, is a lot more fun to do, you’re much more proud of it. When the culture is really there, you don’t have to worry about things; you know that the business is going to survive long-term. People really come to work wanting to engage in this fascinating business that we’re in. When you trust each other and you’re working together with the right values, things happen in a very positive way. It makes the business much more robust and more resilient. FB: Interestingly, Michigan, the state where Cascade is incorporated, has not passed benefit corporation legislation. CK: We thought it was more important at this point to be registered in Michigan and support our state [than to incorporate in another state as a benefit corporation]. FB: Do you think Cascade’s growth is attributable to the TBL philosophy and the values that you hold? FK: I see them as kind of intertwined. I don’t think you can be so Newtonian as to say that the cause of our growth has been because we are a B Corp, or because we have the values we have. We don’t have a growth objective, we have an objective of being a healthy organization, and guess what, a result of that is the growth. The health of the organization is determined by the people in it, by the culture in it, and if you’ve got the right culture and the right folks, they want to make things happen. They want to make things grow.